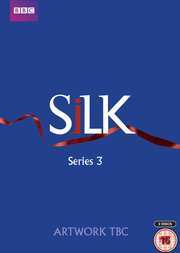 Time to look at a few titles arriving courtesy of BBC Worldwide over the coming months, starting today with court drama Silk: Series 3 which gets a DVD release on the 7th April priced at £20.42. This stars Maxine Peake, Rupert Penry-Jones and Neil Stuke. A box set containing the first three series will also be available for £30.63. Martha is now an experienced QC at the height of her powers and should be enjoying the high-profile cases and media attention that implies. But as her cases become ever more morally complex Martha questions whether her role as a defence barrister is enough. Her close relationships are put to the test when her ambitious colleague and rival Clive Reader finally becomes QC, challenging her to confront her feelings for him. As Head Clerk Billy Lamb struggles to keep the huge secret he’s been concealing he makes plans to secure the future of Chambers, with or without him. Effective new Practice Manager Harriet has other ideas and wants chambers to prosecute more and defend less potentially isolating Martha. As she struggles with her conscience her faith in the justice system is tested to breaking point. Where does she really belong? Following the above on 14th April and winning our award for the dodgiest English accent by a Canadian in a TV Production 2013, is the action thriller Orphan Black: Series 1, turning up on both DVD for £25.52 and Blu-ray priced at £30.63. This stars Tatiana Maslany in the lead role. Sarah is an outsider and orphan whose life changes dramatically after witnessing the suicide of a woman who looks just like her. Sarah assumes her identity, her boyfriend and her bank account but quickly finds herself caught in the middle of a deadly conspiracy and must race to find answers about who she is and how many others there are just like her. Filled with surprising twists and turns, this addictive new series will keep you on the edge of your seat from start to finish.